12 Inch Cut-Off Saw Rental- Stihl – TS 410 A is available for rent in Rochester NY, Ithaca NY and the entire Western New York region from the Duke Company. The rental Stihl TS410A Cutquik 12 inch cutoff saw can be rented, features wet cutting performance, an electronically controlled fuel injection, reduced emissions, advanced air filtration system, anti-vibration system, and semi-automatic belt tensioning and ergonomic grip. This saw features balanced performance and power. 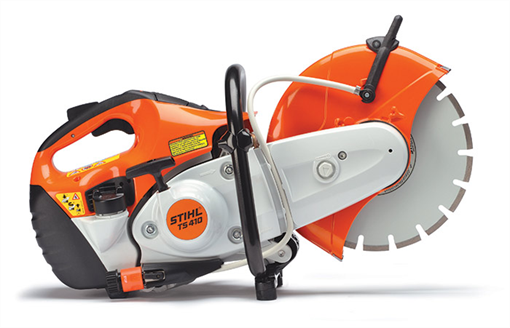 Precautionary note from Stihl: Never use carbide-tipped, wood cutting or circular saw blades on cut-off machines. They can cause severe personal injury or death from reactive forces, blade contact or thrown tips. Never cut wood of any type.